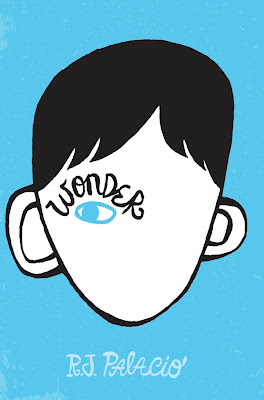 In my typical late-to-the-party fashion, I am going to gush about Wonder. You will find all sorts of glowing reviews and pronouncements of 2013 Newbery contention across the bibliosphere. I doubt I have much to add. It's good, REALLY good. It's important, especially given all the needed focus on bullying, REALLY important and timely. It probably does have a decent Newbery chance for 2013 (although I will argue that it is a bit too anchored in modern vernacular and cultural reference to fit Newbery and also because I really want The One and Only Ivan, which is better in the timeless writing category though equal in the authentic voice category, to have a chance too). Since I have nothing to add to the Wonder lovefest; I guess I will do what I do here and post the linky stuff one will need for classroom assistance! Publisher's Synopsis: "August (Auggie) Pullman was born with a facial deformity that prevented him from going to a mainstream school—until now. He's about to start 5th grade at Beecher Prep, and if you've ever been the new kid then you know how hard that can be. The thing is Auggie's just an ordinary kid, with an extraordinary face. But can he convince his new classmates that he's just like them, despite appearances?" The author's website precepts (rules about really important things). EXCELLENT for teaching!!! The author's annotations of cultural reference you may want to keep handy. There are A LOT! Author interview on her own site. Or, even better than a review,... How about this story from a teacher with a student in a similar situation as Auggie: Jen @ Teach Mentor Texts, you rock teacher! AWESOME Pledge to Choose Kind website where you can find tons of additional resources on anti-bullying and just being kind! found via Mr. Schu at Watch. Connect. Read. Character Development: Good Plot Engagement: Very good, motivated by wanting kindness to prevail!